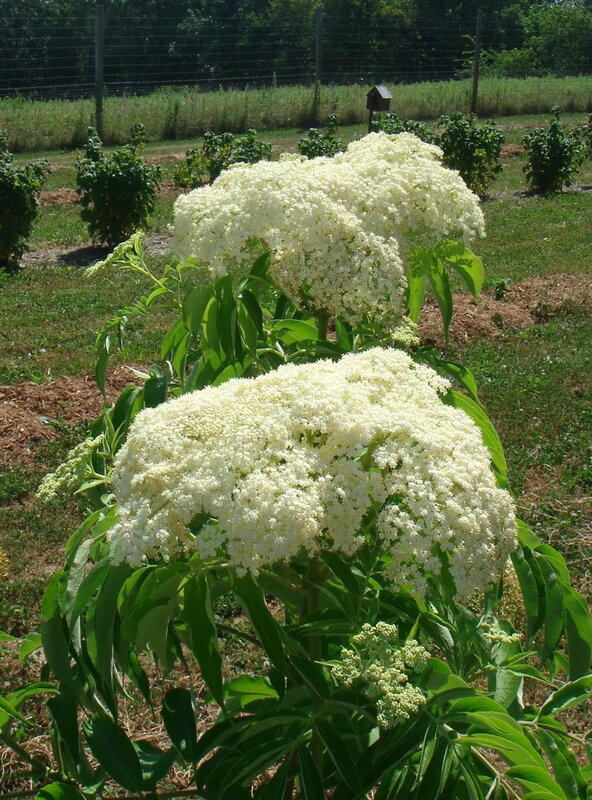 The Elderberry Sambucus canadensis is a medium shrub with white flowers called a cyme. When ripe, the cyme contains a multitude of dark purple fruits. Elderberries can be found wild in the continental US along roadsides and tolerate a wide range of growing conditions. They can be grown as an ornamental plant for wildlife food, or for production of flowers or fruits. Both the flowers and fruits of this plant are edible. A new study by the Midwest Elderberry Cooperative has found that the north american genus we grow do not contain cyanids as do the European varieties. Eating elderberry seeds are as safe as eating apple seeds. Nevertheless, we advise you to de-stem and cook elderberries before consuming. At Blue Fruit Farm, we grow the cultivated varieties of York, Johns, Adams, Nova, Wyldewood, Bob Gordon, and Ranch. Some were purchased as nursery stock from Saint Lawrence Nursery in upstate New York. The Bob Gordon, Wyldewood, and Ranch were originally obtained from Terry Durham of River Hills Harvest in Missouri. We start harvesting elderberries in late August, and continue until frost. Jim now propagates our own nursery stock replacements. The new plantings come from our own cuttings propagated in peat moss and vermiculite. Elderberries have numerous health benefits and have actually been used as medicine around the world for centuries! The anti-viral and anti-inflammatory characteristics of elderberry make it a “must have” for a good health maintenance plan especially during the cold and flu season. Our customers give raving reviews because during cold and flu season when others are falling ill, a blue shot of Elderberry Juice a day has kept the doctor away (and the sick days away). Elderberries are rich in minerals including potassium, iron, and phosphorous. They contain Vitamins A, B and C. They are high in antioxidants, being rated over 14,000 on the Oxygen Reduction Absorbency (ORAC) table..
Elderberries aid digestion, support cardiovascular health, bone and respiratory health, boost immunity, enhance skin, and promote weight loss. Because elderberries contain anthocyanin, they can help to prevent cancer. For more information on elderberries click here. The juice makes delicious jellies, juices, syrups, salad dressings, and can be used to enhance barbecue sauces. Historically, it has been used for its medicinal properties, taken as a tincture or concentrate. Elder flowers make a great tea and can be used in salads. The fruits, leaves, and inner bark can all be used to produce dyes. Our customers use elderberry by making gummy bear chews and cough syrups. Some people drink elderberry juice and mix the frozen berries in with smoothies during cold and flu season. We sell elderberries on the stem by the pound, but also have a bicycle-powered de-stemmer so we can de-stem the berries for you. Some people freeze the berries before gently pulling them off the stem. We de-stem fresh berries, inspect for debris and insects, and freeze in 5 lb bags. We sell 12 oz bottles of Elderberry Juice and Elderonia Juice (2/3 elderberry and 1/3 aronia juice). If you are interested in ordering elder flowers, contact us directly. Check out our gummy bear recipe for the kiddos to keep our little ones healthy too!